German philologist; born Jan. 14, 1803, at Gross Glogau; died there May 3, 1871; cousin of Salomon Munk. He studied from 1822 to 1825 at Breslau and Berlin, and was a favorite disciple of August Böckh. 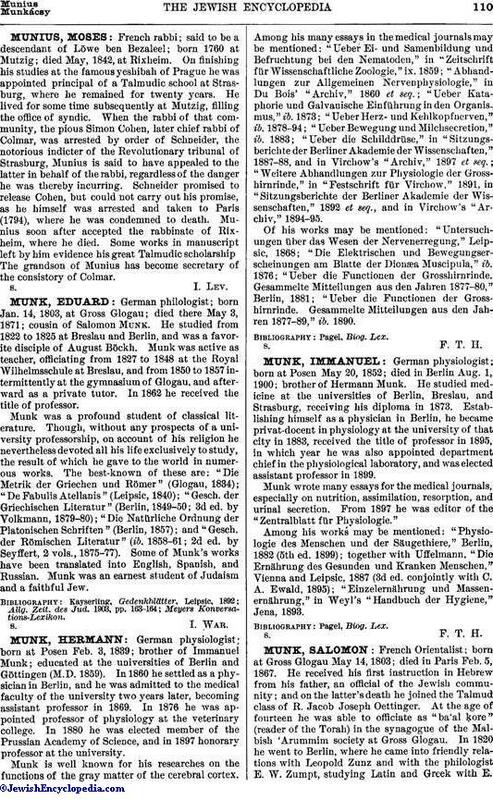 Munk was active as teacher, officiating from 1827 to 1848 at the Royal Wilhelmsschule at Breslau, and from 1850 to 1857 intermittently at the gymnasium of Glogau, and afterward as a private tutor. In 1862 he received the title of professor. Munk was a profound student of classical literature. Though, without any prospects of a university professorship, on account of his religion he nevertheless devoted all his life exclusively to study, the result of which he gave to the world in numerous works. The best-known of these are: "Die Metrik der Griechen und Römer" (Glogau, 1834); "De Fabulis Atellanis" (Leipsic, 1840); "Gesch. der Griechischen Literatur" (Berlin, 1849-50; 3d ed. by Volkmann, 1879-80); "Die Natürliche Ordnung der Platonischen Schriften" (Berlin, 1857); and "Gesch. der Römischen Literatur" (ib. 1858-61; 2d ed. by Seyffert, 2 vols., 1875-77). Some of Munk's works have been translated into English, Spanish, and Russian. Munk was an earnest student of Judaism and a faithful Jew.